A "seer" is a person who stands in the gap between man and God. This is NOT a psychic, but MUCH MORE. IT IS OF GOD'S TRUTH. A psychic reads the energy that surrounds you, and that you are made of - this includes your fears, wishes, desires. A seer is gifted with the ability to see, hear, and be led by God, Jesus and the Holy Spirit. There is a special "anointing" or "mantle" on me - there is a divine calling on my life. These readings take time - but are life changing. who is God? who is Jesus? who is the Holy Spirit? who are they within you? (the kingdom of God is within!) how do you find them? If you are looking for a quick "psychic" input - don't embarrass God with those questions. Psychics, tarot readers and diviners are specifically spoken against in the Bible. These readings are part of a ministry of spiritual counseling and teaching. Angels-Among-Us has been a user of Keen since 2001. 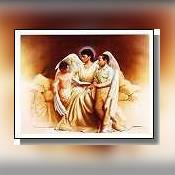 Getting Love & Relationships advice from Angels-Among-Us through www.keen.com is safe, secure and confidential.